In 2004 BWCF donated £1,500 to help support about 250 pupils from 12 Merseyside Special schools participate in the 2005 Panathlon Disability Challenge. The sports involved are boccia, football, kwick cricket, hand cycling, table cricket and athletics. Each participant is awarded a special medal at the end of the day as a reminder and memento of their participation in these mini Paralympics. 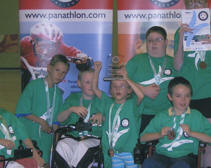 BWCF supported Panathlon with an additional £3,000 in 2007. The form is available as an electronic PDF document which can be read with Adobe Reader. A selection of grant recipients is listed below. Click on the logo for a link to their website.